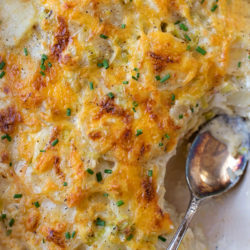 This cheesy casserole is bound to be a new favorite! It’s a lightened up version of a classic, and completely made from scratch. Get your forks ready, because you’re gonna wanna eat a plate full of it! Ugh. ???? When we were first married and both in college/working, I made what felt like a million versions of broccoli chicken casserole. With rice, with noodles, with biscuits, with a myriad of veggies. They were a quick and easy way to get dinner on the table. However, to be honest, none of them were amazing. None of them made me want to eat them again, which led to the next version and so on. Why am I telling you this? 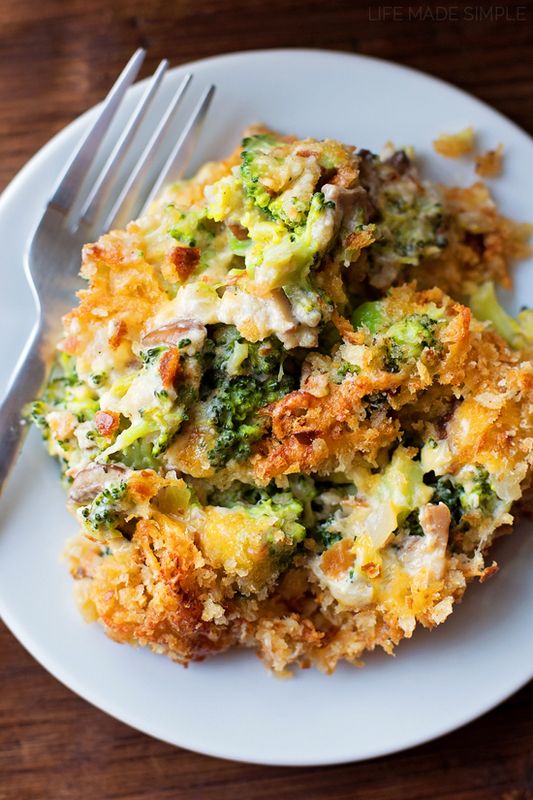 Because I had sworn off “broccoli casserole” for years, until now. I had a ton of broccoli sitting in our fridge the day before Christmas, and I really wanted to use it up…. but like I mentioned above, I really wanted to make something other than said casserole. I did some serious hunting. Came up with nada. So I decided to bite the bullet and make what I had been avoiding for so dang long (minus the chicken). And you know what? It was DELICIOUS! I owe it to the crispy mushrooms, the challah breadcrumbs and the cheese. They sold me. Not only was I in love, but the hubby and toddler were too. I made it again a few weeks ago for a family dinner and we all ate seconds… and thirds. The entire dish was gone by the end of the night!! We will definitely be making this over & over again. I tried to be as clear and concise as I could be in the directions. It is a little time consuming to put together, but it’s definitely worth it. I used a steamer bag for the broccoli and tossed it into the microwave to save time & reduce the amount of dirty dishes. If you can find them, I’d recommend buying them in bulk! Make sure you brown your mushrooms! Don’t just lightly cook them. They add so much flavor and depth to this dish… a few minutes more is going to make a huge difference. I used plain Greek yogurt to thicken up the base. You can’t taste it at all. But if that weirds you out, feel free to use light sour cream. 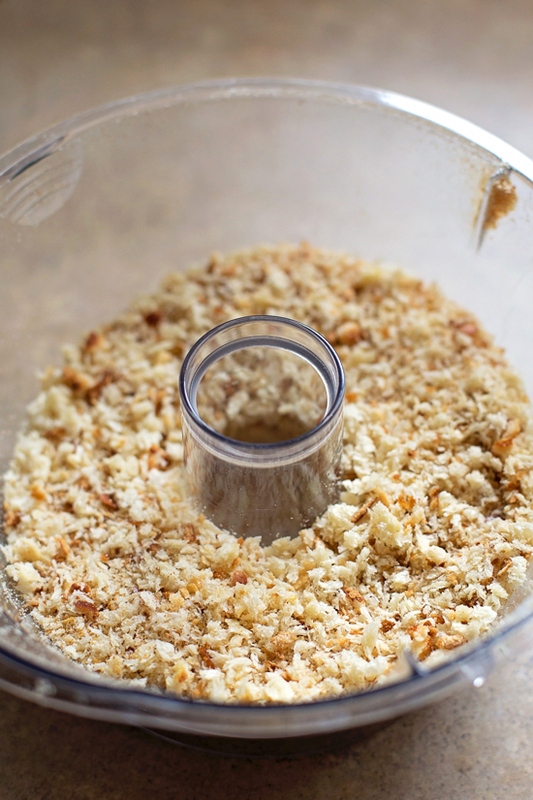 Lastly, you can use whatever breadcrumbs you want. The first time I made this I used panko, but the second time I forgot to buy more and all we had on had was a loaf of challah. So I cut it up, toasted it and gave it a whirl in my food processor. Moral of the story, use what you have on hand. 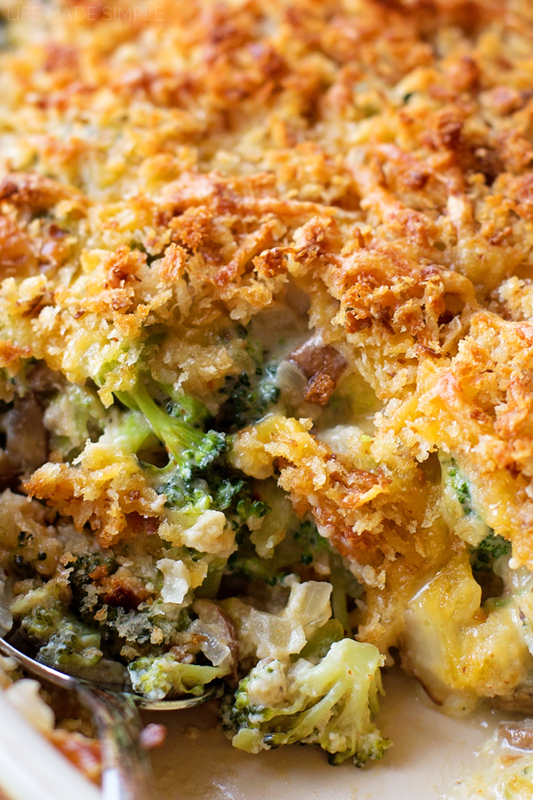 Bake the casserole until bubbly and golden brown on top. Let it sit for a good 10 minutes before serving it. That allows it to thicken and set. Watch it disappear before your eyes. Seriously. This is a great way to get your kids to eat their veggies! Enjoy ???? 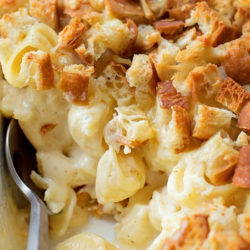 This cheesy casserole is bound to be a new favorite! It's a lightened up version of a classic, and completely made from scratch. Preheat oven to 350 degrees. Lightly butter a 9x13-inch baking dish; set aside. Steam broccoli for a few minutes (do not fully cook the broccoli). Place the broccoli in a large mixing bowl; set aide. In a medium saucepan set over medium heat, add the olive oil. Add the mushrooms and brown, about 6-7 minutes, stirring occasionally. Add the onion and garlic and cook until translucent and fragrant. Transfer to the bowl with the broccoli. In the same saucepan, melt 2 tablespoons of the butter. Whisk in the flour and cook for 1 minute. Slowly whisk in the milk and half-n-half until smooth. Bring the mixture to a low simmer, whisk until thick. Remove from the heat and whisk in the salt, pepper, paprika, cayenne pepper and Greek yogurt. Pour sauce into the large mixing bowl (with the veggies). 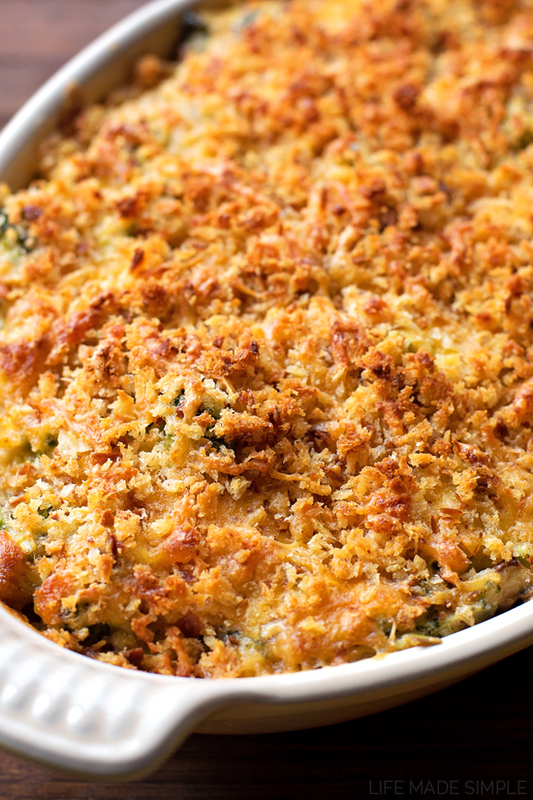 Add the egg, 1 cup of the cheddar cheese, and ½ cup of the breadcrumbs, mix until combined. Pour into the prepared baking dish. In a medium microwave safe mixing bowl, melt the remaining tablespoon of butter. Toss the remaining breadcrumbs in and stir to combine, then mix in the remaining cheese. 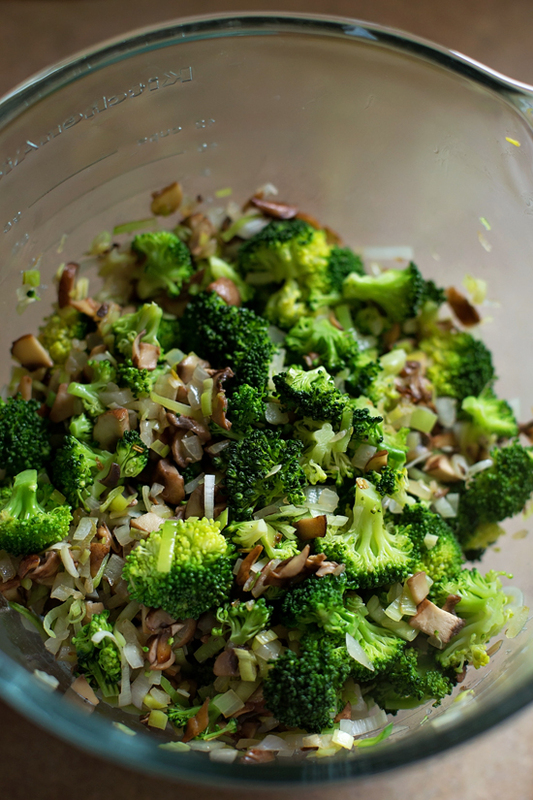 Sprinkle evenly over the broccoli mixture. Place in the oven and bake for 30-40 minutes or until it bubbles and browns (place a piece of foil over top to prevent over-browning at the 30 minute mark). Remove from the oven and let stand for 10 minutes before serving. 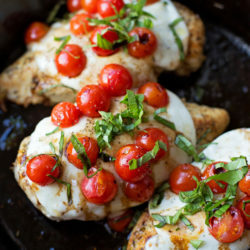 -Try adding chicken or ham to this dish for a complete meal! This recipe looks and sounds so darn good. 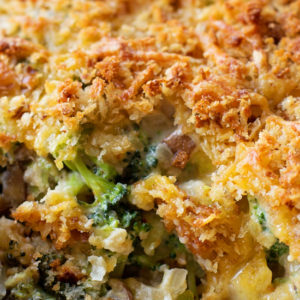 We love broccoli in any form so this is a winner. Pinned. Thanks for sharing. Hi! Is it possible to make this ahead and freeze it? Also, do you have a substitute for the mushrooms? My brother in law hates mushrooms and I want to make this for Thanksgiving. Thank you!! This looks and sounds SO Good !! I’m surprised there aren’t more reviews. I plan on making it at Christmas ! Thanks Natalie… Love a Lighten up version..
I’ve been looking for a lighter version and this sounds perfect. Any idea what the calorie difference is between your version and the old, faithful Campbell soup version? Looking forward to trying this one. If someone will whinge about mushrooms, remember, they’re chopped up. Just don’t tell ’em they’re in there. Nice casserole, I made 1/2 and got 6 servings as a side.